Philip David Charles "Phil" Collins, LVO (born 30 January 1951), is an English singer, songwriter, multi-instrumentalist and actor. He gained fame as both the drummer and lead singer for the rock group Genesis, and he gained worldwide fame as a solo artist. Collins is one of the most successful songwriters and performers of all time, singing the lead vocals on dozens of hit albums and singles in the United Kingdom and the United States between 1976 and 2010, either as a solo artist or with Genesis. 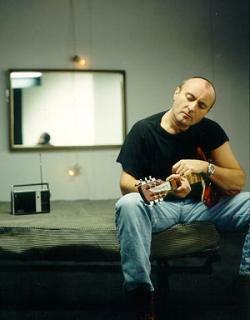 His solo singles, sometimes dealing with lost love and often featuring his distinctive gated reverb drum sound, ranged from the atmospheric "In the Air Tonight", dance-rock of "Sussudio", piano-driven power ballad "Against All Odds", to the political and religious connotations of "Another Day in Paradise". AllMusic has described Collins as "one of the most successful pop and adult contemporary singers of the '80s and beyond". Collins joined Genesis in 1970 as the group's drummer and became their lead vocalist in 1975 following the departure of the original lead singer Peter Gabriel. His solo career, which was launched in 1981 and was heavily influenced by his personal life and soul music, brought both himself and Genesis greater commercial success. Collins's total worldwide sales as a solo artist are 150 million. Collins has won numerous music awards throughout his career, including seven Grammy Awards, six Brit Awards�winning Best British Male three times, three American Music Awards, an Academy Award, two Golden Globe Awards and a Disney Legend Award in 2002 for his solo work. He received a star on the Hollywood Walk of Fame in 1999, was inducted into the Songwriters Hall of Fame in 2003, and into the Rock and Roll Hall of Fame as a member of Genesis in 2010. Collins was listed at number 22 in Rolling Stone magazine's "100 Greatest Drummers of All Time", number 10 in a countdown by Gigwise and number 9 by MusicRadar. Collins is one of only three recording artists (along with Paul McCartney and Michael Jackson) who have sold over 100 million albums worldwide both as solo artists and (separately) as principal members of a band.During his most successful period as a solo artist between 1981 and 1990, Collins had three UK number-one singles and seven number-one singles on the Billboard Hot 100 in the United States, as well as a US number one with Genesis in 1986. When his work with Genesis, his work with other artists, as well as his solo career is totalled, Collins had more top 40 hits on the Billboard Hot 100 chart during the 1980s than any other artist.In 2008, Collins was ranked the 22nd most successful artist on the "Billboard Hot 100 All-Time Top Artists". Although one of the world's best-selling recording artists and a highly respected drummer, Collins has garnered significant criticism over the years from music journalists and fellow artists. He announced his retirement in 2011 to focus on his family life, however he continued to write songs and in 2013 he said he was considering a return to the music industry.